By Michael Smallwood. Header image displays an improvised launcher in a two-tube configuration mounted on the rear of a pickup truck. 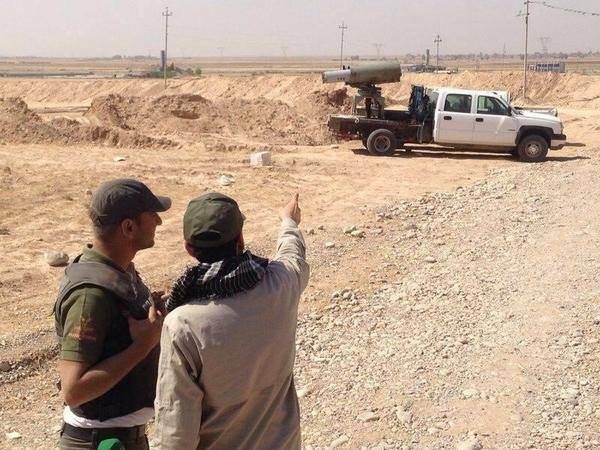 Photos emerging from Iraq purport to show members of the Islamist militant group Asa’ib Ahl al-Haq (AAH) in possession of 333 mm Falaq-2 artillery rockets and improvised launchers. In the photo below, a substantially larger payload has been affixed to the forward portion of the rocket, in what is known as an ‘improvised rocket-assisted mortar’ (IRAM) – more accurately described as an improvised rocket-assisted munition. It is unclear whether this replaces or is in addition to the standard 117 kg high-explosive (HE) warhead that the Falaq-2 possesses. The maximum range of the Falaq-2 is 10.8 km, though this is sure to be reduced dramatically by the addition of such a large improvised warhead. It is unclear how many such IRAMs have been produced based around the Falaq-2 in Iraq. The Falaq-1 and Falaq-2 systems have been documented in use in Syria previously, and it is likely to be from here that systems seen in Iraq have originated. For a comprehensive background on the Falaq-1 and Falaq-2 system, and the use of IRAMs with these systems, you can read ARES Research Report No. 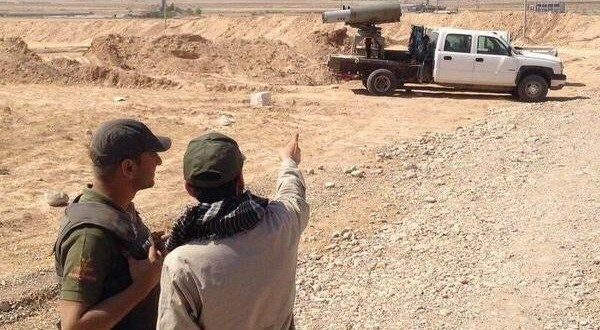 2: Iranian Falaq-1 and Falaq-2 Rockets in Syria. Special thanks to Eliot Higgins. Photos taken from a since-deleted source. Location and group affiliation should be considered unconfirmed at time of publishing. Technical characteristics from ARES Research Report 2.